I shared the details of my single-color 8X40 LED matrix display board project here a few months ago. 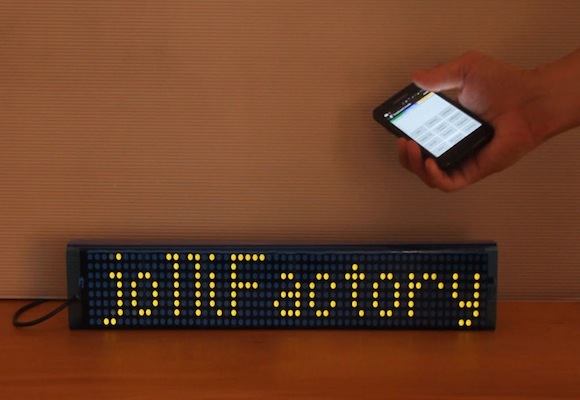 Here is a nice instructable on making a 7 Bi-color 8×8 LED Matrix Scrolling Text Display with Bluetooth support; which means you can send messages and commands to the display via Bluetooth using a Smart Phone. The author illustrates using an Android-based phone, but any devices capable of sending text messages via Bluetooth would work. The project uses 7 Bi-color 8×8 LED matrices, each controlled by two MAX7219 chips. The beauty of using MAX7219 is they take a lot of work off the micro-controller and simplify the design. Moreover, they can be daisy chained and require only three output pins on the micro-controller for the required SPI-interface. 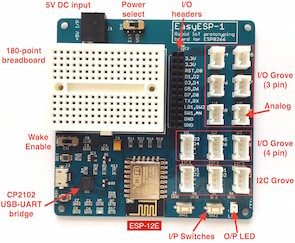 The project is constructed using the Arduino embedded platform. In order to achieve faster speed and better scrolling effect, the author used the chipKit Uno32 board instead of the original Arduino Uno board. A HC-07 Bluetooth module is used for wireless serial communications between the display and the Android Smart Phone. I put up the instructable 7 Bi-color 8×8 LED Matrix Scrolling Text Display sometime back and was quite surprise it was mentioned here. Recently, I put up another instructable to build another 7 Bi-color 8×8 LED Matrix Scrolling Text Display with some enhancements to it. In this new instructable, we will not be using the LedControl library for the project and instead will be using the SPI library to directly transfer instructions and data to the display. It may not look like a huge change to the project but using SPI for the interface offers impressive increase in data transfer speed which translates into fast and smooth scrolling text effect for the project and also reduces some complexity to the wirings as only 3 SPI lines are needed to drive the display instead of 6 previously. We have a project “Android controlled led message display using bluetooth” plz help us to develop this project or give us some usefull hints…..